Uncle Ruslan Tsarni: The uncle of bombing suspects Dzhokhar and Tamerlan Tsarnaev’s extraordinary message about collective responsibility (VIDEO). The bombing suspects’ uncle delivers an extraordinary message about character, shame, and collective responsibility. 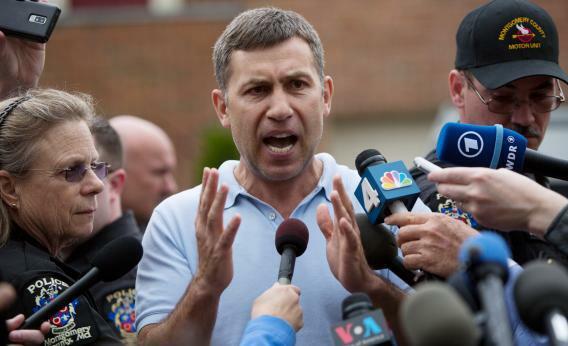 Ruslan Tsarni, uncle of the suspected Boston Marathon bombers, speaks to reporters in front of his home on Friday in Montgomery Village, Md. From the moment we heard of an explosion at the Boston Marathon, the talk on television, Twitter, and in everyday conversations has been about which category the killers belonged to. Muslims? White supremacists? Arabs? Dark-skinned? Even in the hours since we learned the suspects’ names, it’s been all about nationality and ethnicity: Chechnya, Dagestan, Kyrgyzstan, Russia. Then, shortly after 11:30 this morning, Ruslan Tsarni, an uncle of the two suspects, stepped out of his house in Maryland and delivered an extraordinary message about character, shame, and collective responsibility. If you haven’t seen the video, watch it below. And keep the memory of it with you in the days to come. Association is a hard thing. The suspects are Tsarni’s nephews. He’s related to them, but he’s also separate from them. “We have not been in touch with that family for a number of years,” he said. The press wouldn’t let go. “Are you ashamed by what has unfolded?” a reporter asked. “Of course we are ashamed!” Tsarni exclaimed. “They are [the] children of my brother.” But even his brother, he cautioned, “has little influence” on the two young men. A reporter asked whether the young men had ever been caught up in the fighting in Chechnya. Tsarni spat back, “No! They’ve never been in Chechnya. This has nothing to do with Chechnya. Chechens are different. Chechens are peaceful people.” The young men weren’t even born there, he said. One was born in Dagestan, the other in Kyrgyzstan. All of us will remember images from this horror. The innocent boy standing on the rail in his final moments. The unassuming killer apparently dropping the backpack nearby. The explosions. The blood-spattered ground. The surveillance video. The manhunt. We’ll gossip and argue about countries, religions, and cultures. But don’t forget the uncle. Don’t forget his plea—even as he begged for forgiveness for his family, even as he lamented the stain on his nationality and his faith—that no religion, no country, and no people can be blamed for such an atrocity. Any of us could be this man, the innocent man who could not shake his shame.